Notice: When indicator shows 100% during charging the UPS, it will take extra 2 to 3 hours or more in tiny stream charge, then the AC CHARGE LIGHT will turn green. Before that the light will still be in red. ★Light Weight & Small Size: Weigh only 27% of traditional UPS, adopting lithium-ion batteries instead of lead acid batteries. Feel convenient to carry outside or stay on your desktop. Net Weight: 6.95 lbs. ★Big Battery Capacity & Environmental Use: Support long-term standby time for different electronic devices or appliances by 288Wh capacity. Recharge lithium-ion battery at least 500 times. ★High Configuration: Provide almost the cleanest supply power same as from AC wall by a rated 500W (surge/peak 1000W) pure sine wave inverter. ★Refined Design: 2 AC Outputs (universal sockets not only fit for US socket), 4 USB ports, and 4 DC Outputs. No gas and no fumes. 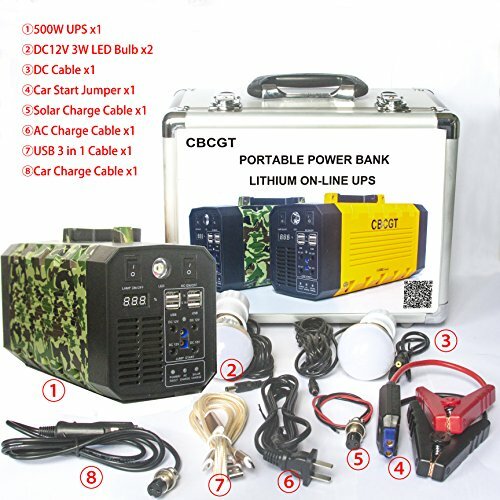 If you have any questions about this product by CBCGT, contact us by completing and submitting the form below. If you are looking for a specif part number, please include it with your message.